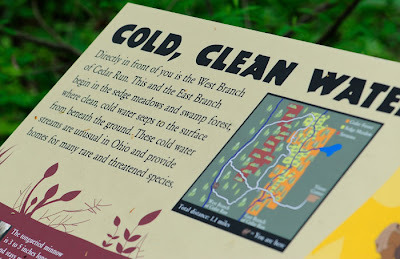 Last Saturday I headed up to Cedar Bog Nature Preserve in Urbana, Ohio with my friend, Teri. I wanted to photograph the beautiful spring ephemerals, and Teri was starting to gather data for her doctoral thesis. I really didn't know what to expect. The only thing I knew about Cedar Bog was that it was a fen...not a bog and many rare plants thrived there. It didn't take me long, however, to find out Cedar Bog is incredible. Huge Skunk Cabbages spread out from the boardwalk that snakes through the fen, and as you walk into the woods it feels like you're walking through an ancient land. I joked with Teri that we should look out for Sleestaks because it felt like we had stumbled into the Land of the Lost...and it really wasn't that far from the truth. According to Eric Doerzbacher, the site manager, some the skunk cabbages we walked past were well over 1,000 years old. 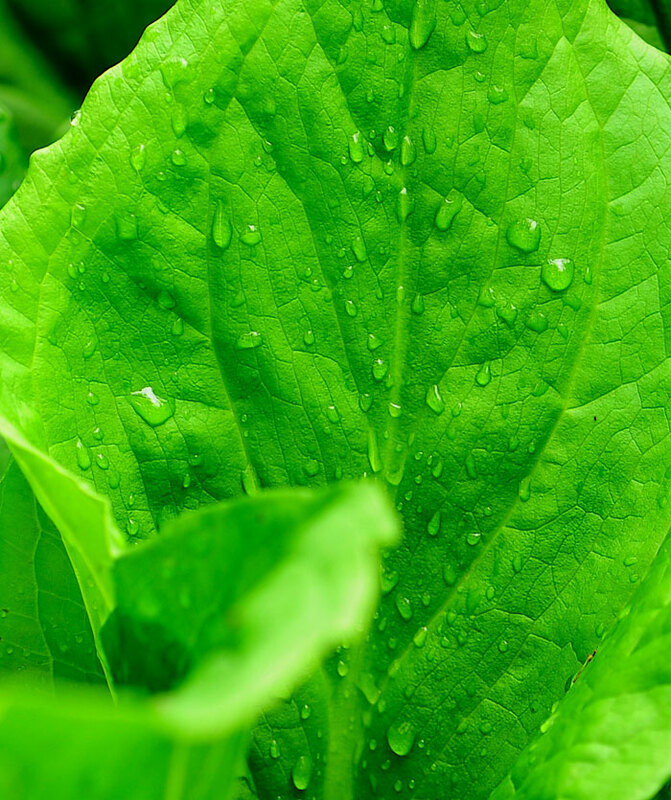 A leaf of a Skunk Cabbage drips with water from an earlier downpour. The fen is fed by cold artesian waters that bubble to the surface with an average temperature 0f 53 - 55 degrees F. As you walk the boardwalk and look below, you can see the water is flowing--in some places it is more noticeable than others, but you can definitely tell it's not stagnant. 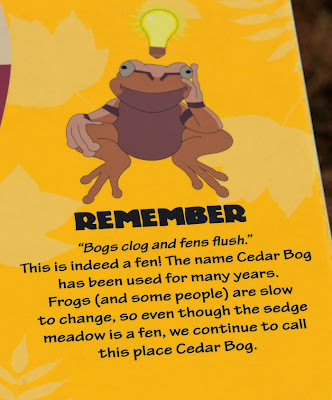 "Fens flush" is a common theme on signs posted throughout the preserve that explain what is going on. The constant supply of fresh, cool ground water creates a cool, northern-like microclimate, which has allowed the relic boreal plants to grow here for so many thousands of years since the glacier's retreat. A few of the many signs posted along the boardwalk. I have a lot of cool photos of the spring wildflowers we found along the boardwalk. I'll start with these Wild Columbine. The Columbine grew along the boardwalk near the central area of the preserve flanking the clear waters of the west branch of Cedar Run creek. For a slightly different view, I wanted to see how the columbine photographed from below. 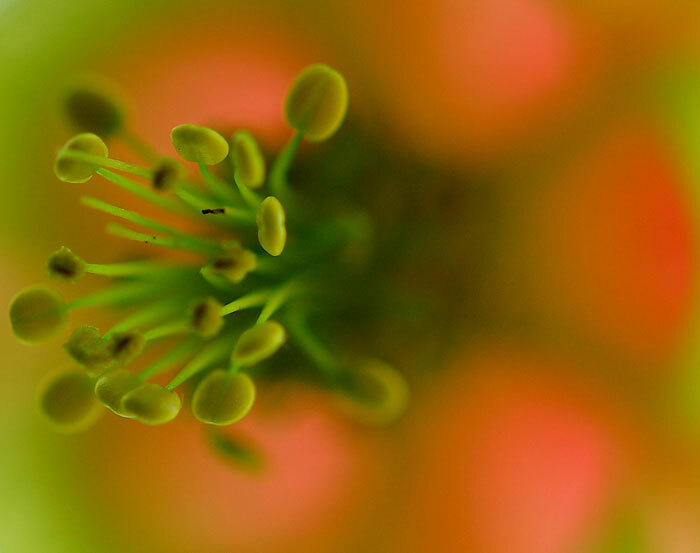 ...underneath a Wild Columbine blossom, looking up into the flower. The light shining through the thin, silky petals from above illuminated the inside of the flower like sun through stained glass. I would never have guessed such interesting shapes and colors could be seen from underneath the blossom. The skies were grey above, but bright, and the brightness coaxed out the incredible pinks and greens. ...green veining and a glowing pink interior show another view of the beautiful Wild Columbine. I liked that leaf picture and the fourth snap too! 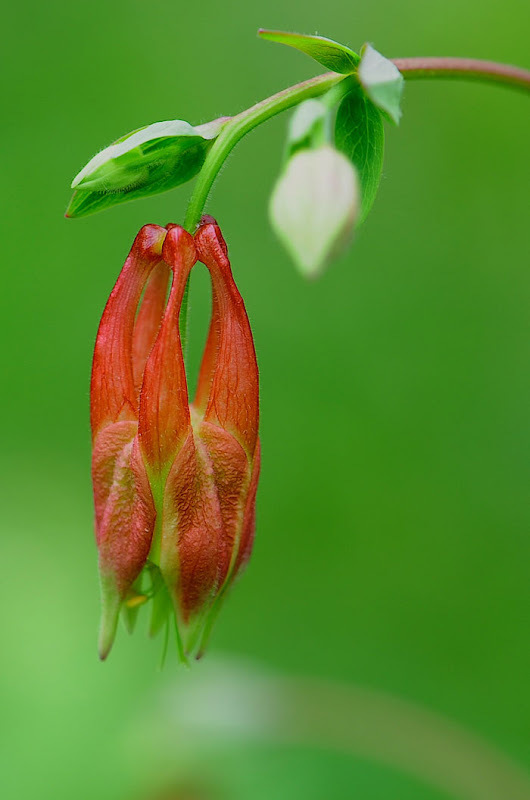 Your Columbine photos are gorgeous - beatuiful colours and interesting shapes indeed! Love the abstraction of the images! Thanks for introducing me to yet another beautiful world! Very intersting blog. We have a lot of Skunk Cabbage in our valley here too which also came about because of glaciers many years ago. The columbine is beatiful. I know they grow wild in Colorado, but I didn't know they grew wild around this part of the country. That last picture looks like something from a kalidascope. Beautiful photos! It looks like a lovely place. I took a field trip with my ecology professor to this place years ago. I had forgotten about it until I read your post. It would take me about 3 hours to get there now, but I think I need to plan a trip. 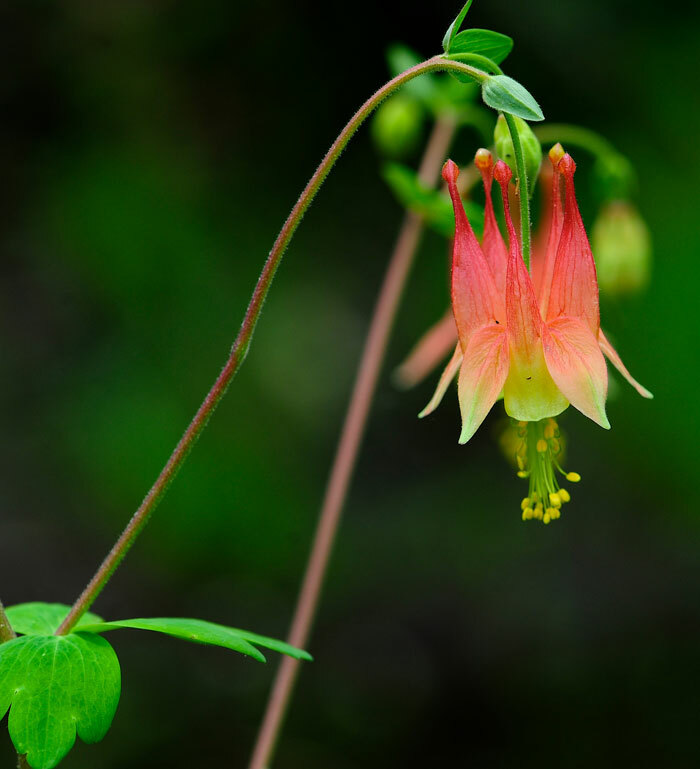 Columbine is one of my favorite spring wildflowers, and you have captured it stunningly! What an interesting place to visit. 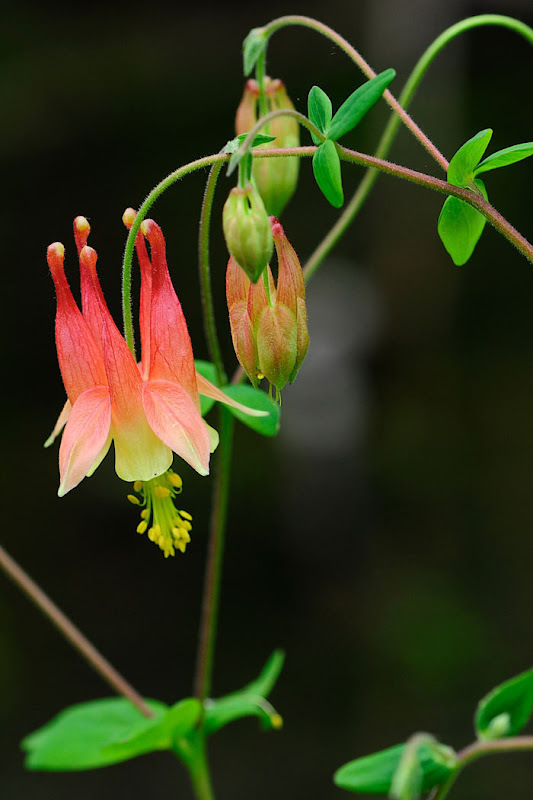 LOVE those photos of the Columbine. Really great how you showed all the different images of the plant!!! It is so interesting to see what makes the beauty of the columbine!! Your photos captured it well!! Thanks for the botanical trip!! Interesting! 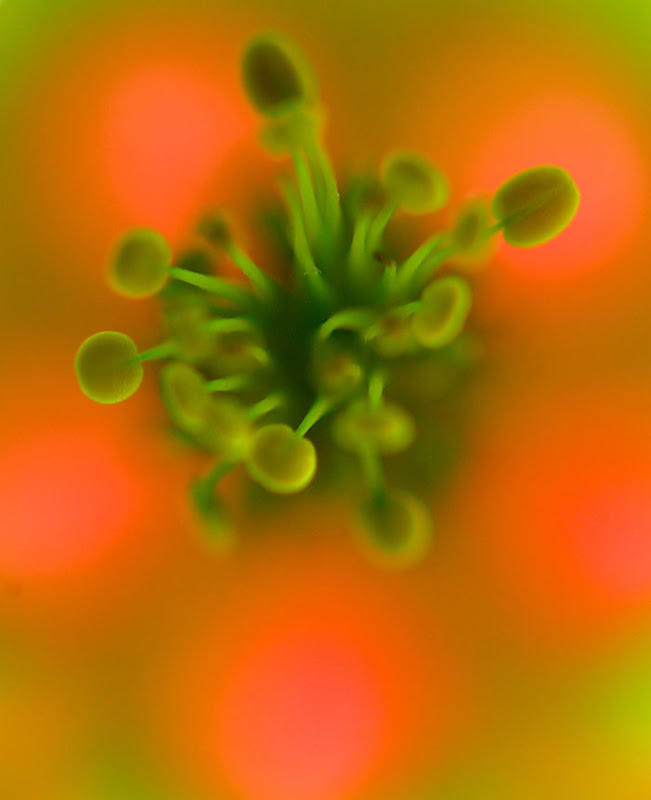 And it looks like you've been playing with the macro lens again. Good work! These are gorgeous images, Kelly! I love Columbine and you give them even great magic! Love the photos of the columbine, so very beautiful! Beautiful flowers and beautiful photos Kelly. Your photos are always wowzers! Gorgeous and wonderful and beautiful and inspirational!!! Beautiful pictures of the Columbine! What an interesting place to visit. Such lovely photos, Kelly! I'm jealous of your trip to Cedar Bog. This was always a popular field trip for the science classes at my high school (Springfield's not too far from Urbana), but somehow I was never in the right science class, so I never got to go!! One of these days I will get there, though. Hey, I get to go to Clear Creek this Saturday for my OCVN class. If the weather's nice, I'll stick around for a bit after class to do some birding and photographing. Now... where is all that extra time you and I need to tap into?! I saw that first picture of the columbine, and thought wow. Then they just got better. Amazing shots Kelly. All of them. Hi Kelly, What an interesting place you visited. Now I know the difference between a bog and a fen... Thanks, Kel! 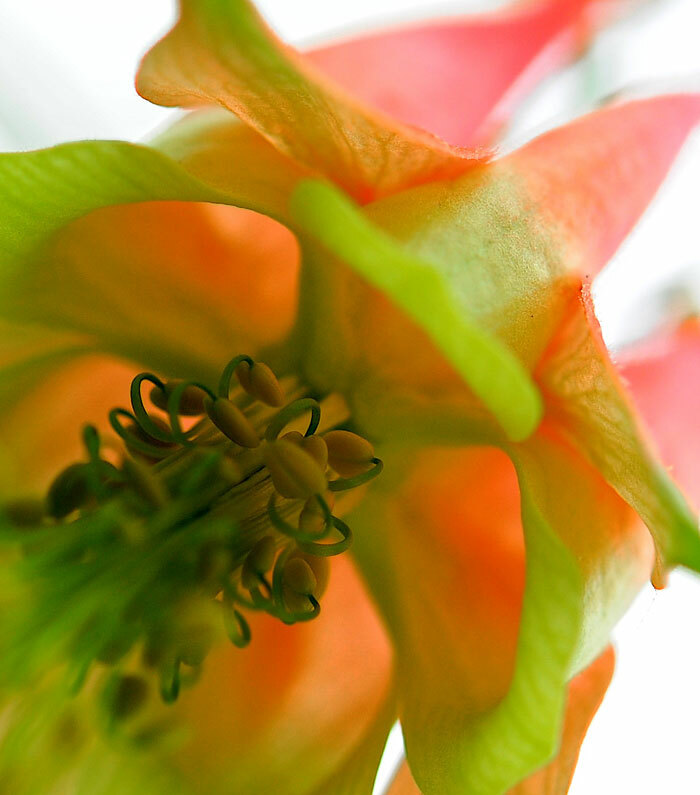 Love the pictures of the Columbine also--especially from below the flowers. Gorgeous photos from the Columbine. Still waiting for flowers here - your images make me impatient! Really nice protected area. One fen I visit has similar background and is like walking on a matress when looking at new growth. A remarkable flower to find in these areas is a Ladies-Slipper orchid which I would love to see you illustrate.These like the skunk cabbage, have a long life, up to 100 years.Check to find out if they have them, a worthwhile find. What a great field trip! The skunk cabbage photo is beautiful, and the columbine shots are outstanding. I have wild columbine planted on the north side of my house, and they are always the first plant to start popping up in the spring. It will still be a little while until they bloom though. I love the different perspective you got by photographing from below. Exquisite! 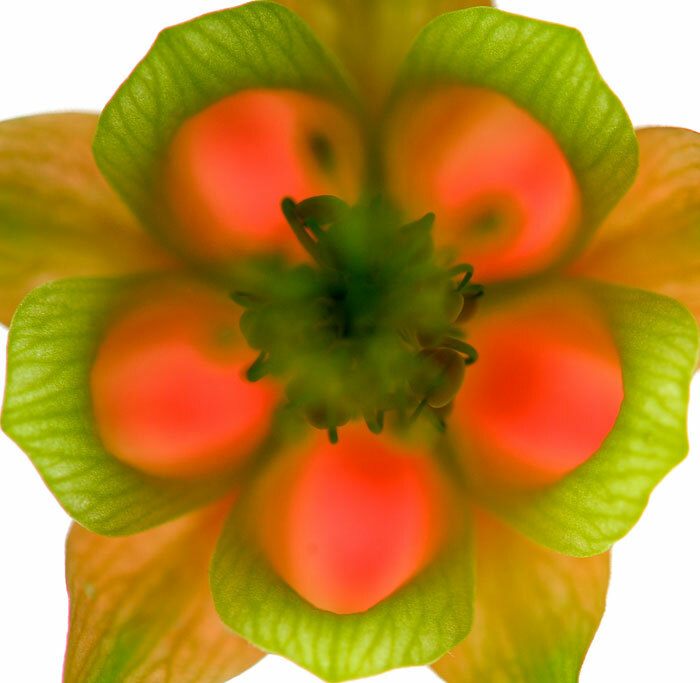 Stunning photos of the columbine blossoms. Stunning shots of the wildflowers! Just absolutely breath-taking. Very interesting post. I really need to make it up there (this weekend, perhaps)! 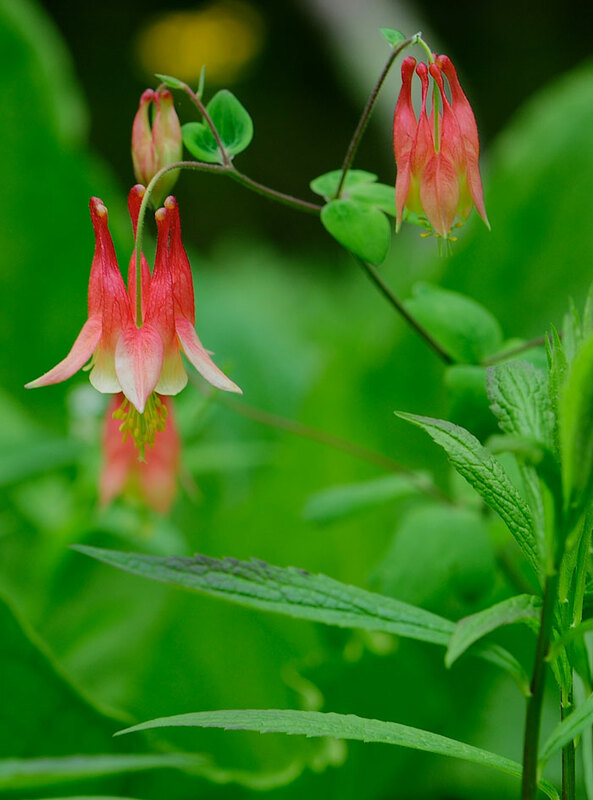 We have columbine blooming here as well, what gorgeous plants. Also just found my first shooting stars today. The Columbine shots are lovely. We also have that wild one here in Maine. I once dug up a Skunk cabbage and planted it in my garden. I thought there was a tremendous negative bias against this wonderful plant, very under rated as a garden plant. Heck, NON RATED! Outstanding photos! What a great Blog!!! 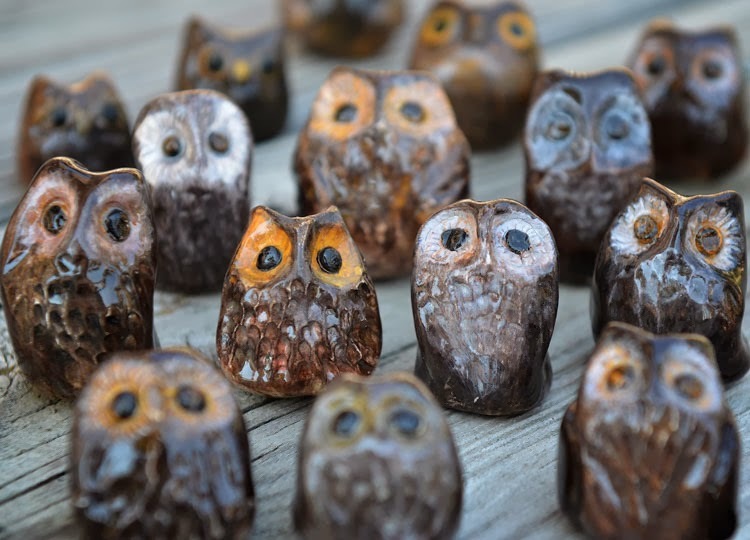 Great photos and nice colors - a pretty unusual post from you. I really like the 4th picture and the last 3 - quite abstract and beautiful. Those are amazing Kelly! Sooooo pretty! I love the descriptions of some of the places you get to visit, it makes me want to go there. It's a shame I'm several thousand miles away! Fabulous shots of the Columbines. YOu really outdid yourself w/ these photos! That first leaf photo was gorgeous - loved examining the detail on it! ...thanks, everyone! Weren't those shots from underneath wild? I'm loving this macro lens and am seeing so many new things with it! Wow...gorgeous macro shots! They are so pretty and the colors really show off in your photos. Beautiful capture of one of my favorite spring flowers! and the gorgeous close-ups leave me searching for words. You have such an eye for expressive colors and shapes! Amazing pictures! Greetings from Barcelona! Oh weee..I love those two last photos!! I came back to see the flowers and enjoy them, so lovely and peaceful, Kelly, thanks for sharing. Hugs to all. Stunning! Every photo is a work of art! Thank you! Welcome to Red and the Peanut! Join me as I hike through the woods and meadows around Cincinnati looking for birds and appreciating nature. Thank you for stopping by! 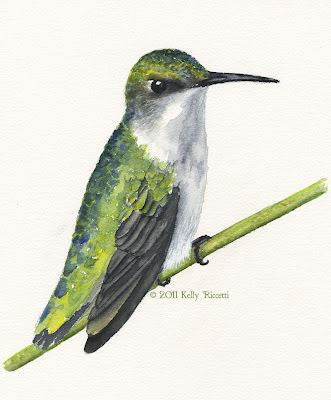 Click here for hummingbird paintings and photos. 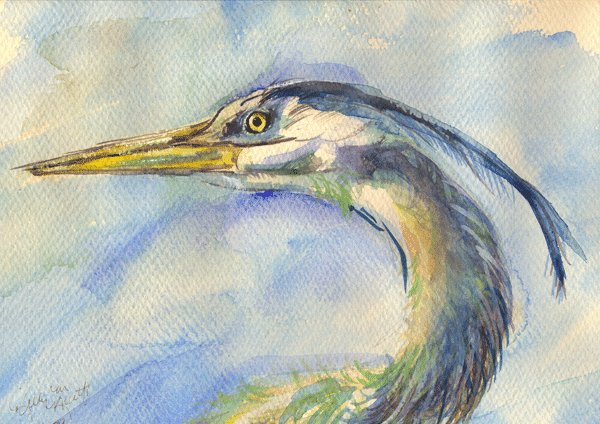 Click here for the 2009 Great Blue Heron Journal. I hand hold the camera for all my photos (I used to use a monopod or tripod for distance and macro, but the VR lenses don't seem to require it). I crop the images down in Aperture (I'm a Mac). The Story Behind "Red and the Peanut"
Red and the Peanut is named after my first bird memory. When I was about six, I was at my Great Aunt Mary's house and she was telling me about Red and the peanut. "Red" was a Northern Cardinal that had trained Aunt Mary to feed it peanuts on demand. Since Aunt Mary's "Red" started it all, what better name could I choose?